Video Recipe - Homemade puff pastry is in a whole other class than the one you buy. There is no comparison. It is also relatively easy to do once you've tried it a few times. Split the butter into small pieces. Mix all the ingredient quickly. The dough should not be kneaded much as it will becomes too tough, elastic, and difficult to handle when it is time to fold it. You should basically stop kneading when there no longer are any visible flour lumps. Gather it into a ball and let it rest covered in the refrigerator for about fifteen minutes to an hour. In the video I say an hour, but that is rarely necessary. I meant "up to an hour". Use a rolling pin to roll out four corners, so the ball is thick in the middle and has four "flaps". When the flaps are stacked together they must be as thick as the rest of the sphere. In this way, the butter to be in the center of the dough. Cover a table with plenty of flour and put the folding butter on it. Sprinkle well with flour on top of the butter. Hit the butter with a rolling pin until it becomes flat, and fold it together. First lengthwise and then crosswise. Put on enough flour on so it does not stick to the rolling pin. Repeat until the butter has the same consistency as the dough. The dough and butter has to be folded together and if they do not have the same consistency, they will not bend the same and there is a risk that the dough cracks and the butter gets pressed out. And you end up with butter all over the place. When you are done, the butter must the same size as the thick part of the dough. Place the butter on the thick. Fold the flaps over it and turn it upside down with the flaps against the table. 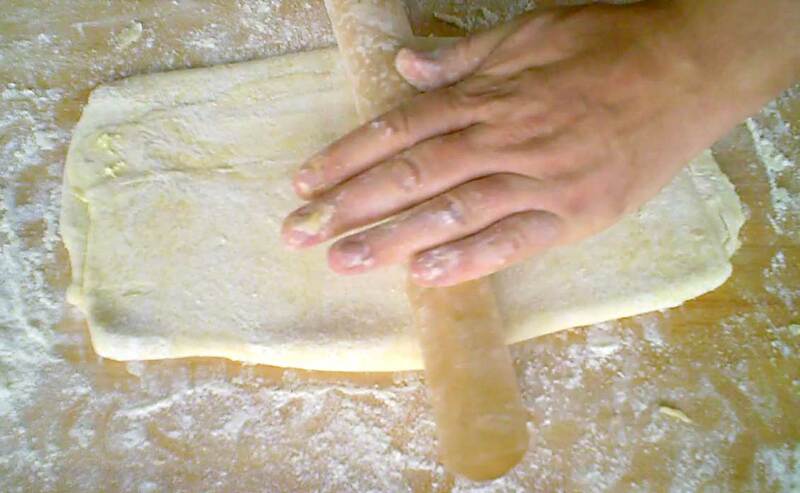 Roll the dough with butter in flat until it is three times as long as it is wide. Fold 1/3 of the dough against the other ende. Fold the second 1/3 over the first 1/3. The dough should now be square. Repeat rolling and folding 3 more times. This is called "a turn"
Make 3 turns for 9 folds total. Put plenty of flour on the dough. Especially where the butter starts to break out through the dough. If the butter becomes too soft, then put the dough into the refrigerator until it stiffens slightly. If the dough becomes too elastic it will pull itself together after you have rolled it out. Then you need to let it rest in the refrigerator for 10-20 minutes. When you are done folding, the puff pastry is ready for storage. It can keep for 2 days in the fridge and 3 months in the freezer. You must roll it out to a thickness of no more than 1/2 cm (1/4 inch) before baking, for the best results. A brief heat shock at first get the puff pastry to raise up even better. When you bake it then put it into a oven preheated to 225°C, and then turn down the temperature to what it says in your recipe. If you want to see what the puff pastry in the video was used for, check out my Tarte Tatin recipe. The leftovers were used to make Palmiers. I have a LOT of info about this folded type of bread in my article "Bread Baking Technique #10 - The technique behind laminated dough used for pastry, puff pastry, croissant, etc."